We take our hand-made biscotti in three flavors (vanilla, almond and/or chocolate) and dip them in fine gourmet Belgian chocolate. Then we personalized them with your artwork image using 100% edible ink on sugar paper and create a "picture frame" out of sprinkles in your choice of colors. 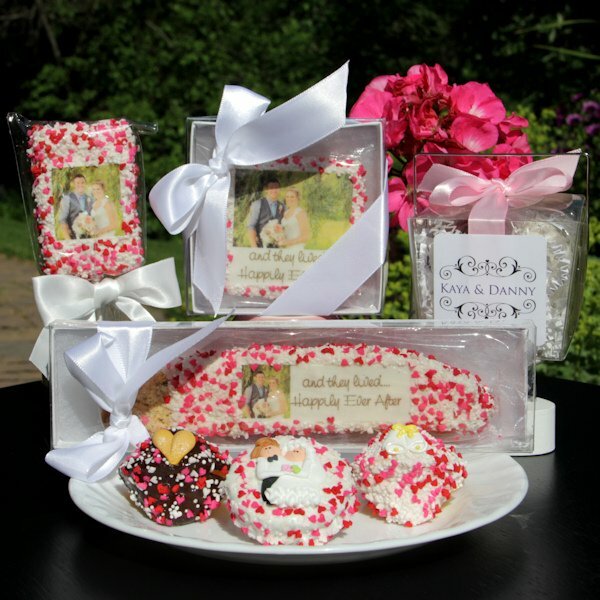 Carefully nestled in a clear view gift box, each biscotti wedding favor is tied with satin ribbon for an elegant presentation. 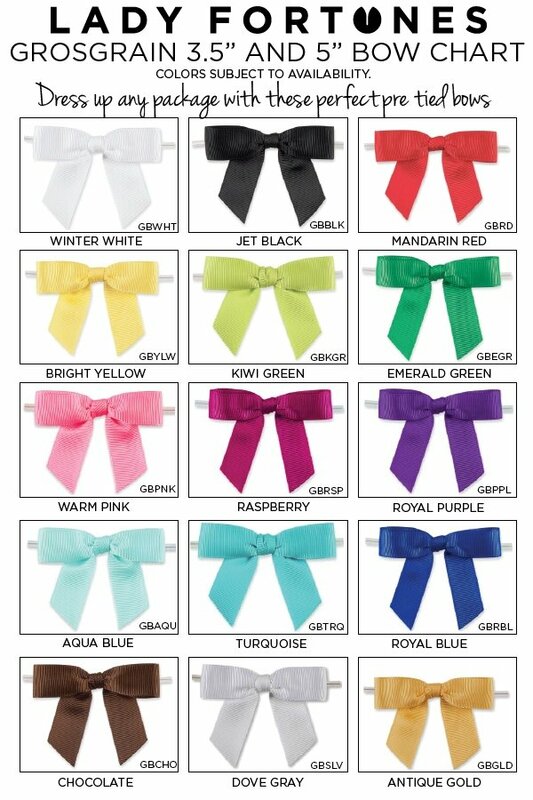 Specify ribbon color at checkout. Minimum order is 6 pieces of biscotti. Each biscotti piece is 6-7" in length inside a 8" x 2" x 7/8" gift box. After placing your order, you can respond to the order confirmation email and attach your photo. Hi do you an option to have them not boxed? 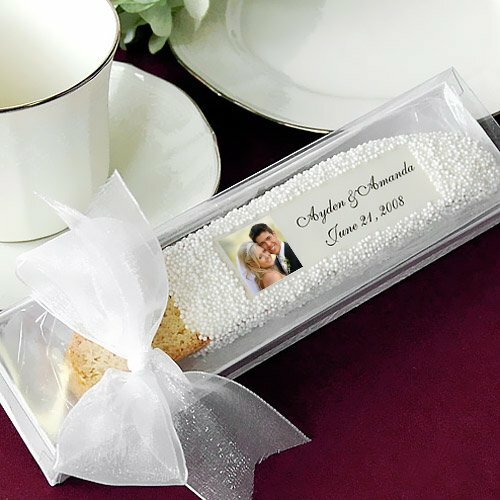 I'm sorry, the Custom Photo Biscotti Wedding Favor in Gift Box is really packaged in a clear view gift box and we're unable to alter it at all from how they're described/shown on our site since they're shipped directly from the manufacturer. I added the item to my cart and under personalization it wants me to enter "gift message" and "gift from". 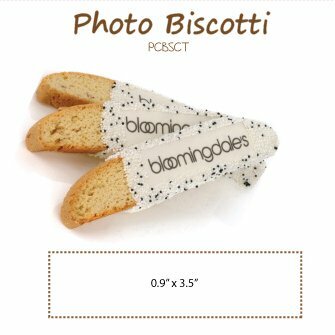 I just want to be able to provide the photo and names and date I want printed on the biscotti. 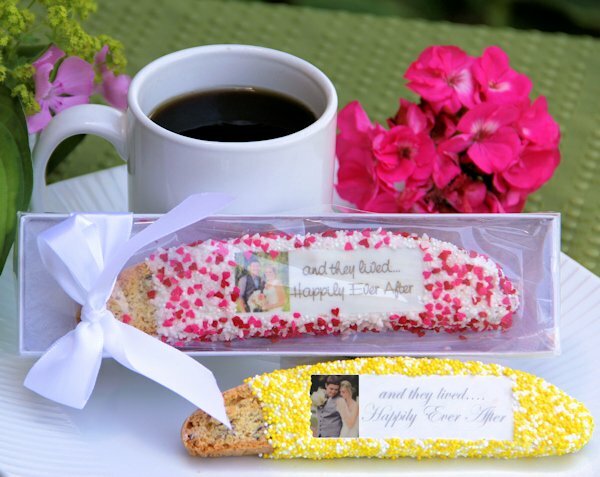 You will need to provide that image via email after placing an order for the Custom Photo Biscotti Wedding Favor in Gift Box. I'm sorry, you won't be able to attach it in the cart. Your order also includes a personal gift message. If you do not want to include a gift messgae, you can enter "None" in the gift message fields if you prefer. That's only if the recipient knows who the gift is from, if sending to someone other than yourself.